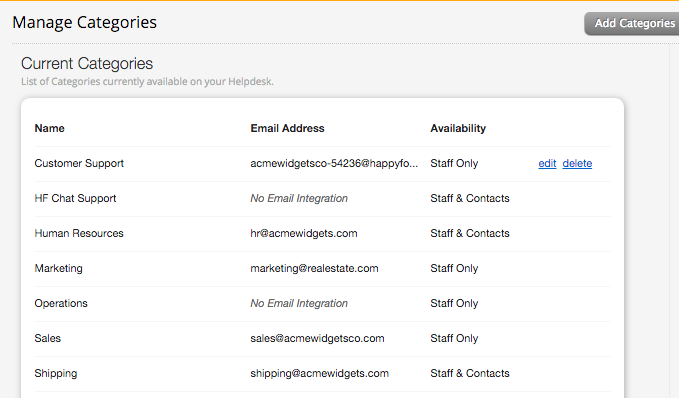 Categories configured in HappyFox can be of two types - Public and Private. Public categories are categories that are visible to both the staff members and the end users and Private categories are visible only to the staff members. You can set the availability of the category under Manage >> Categories. Marking a category as private, will not display the category in the new ticket form at the time of ticket creation on your customer portal. You can edit an existing category at any point in time and change the availability of the category.